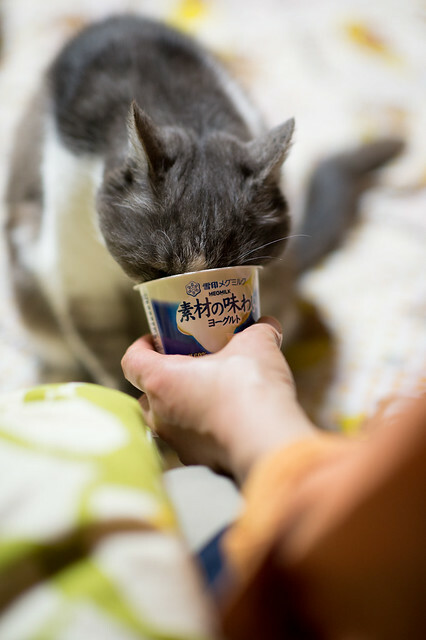 Miyako loves Yogurt | Flickr - Photo Sharing! The food inside of the cup is yogurt. Actually Miyako loves yogurt. It sounds a little strange, but I've found a web page saying some cats love yogurt. Miyako is one of them. Kim's Pics :), and 2 other people added this photo to their favorites. Excellent shot, I'll have to see if Macey would like this snack the next time I have yogurt! Aww, I don't eat yogurt often but my girls do like it. They all love custard too, it's one of their favourites. Ka-Sa is usually sick after dairy so she's not allowed cheese etc so she always gets extra custard to make up for it. Wow I did not know cats eat yogurt but if they love milk it makes sense they must like yogurt too. This is really cute. I've tried my cats with yogurt, but they don't seem to care for it.